HVAC and Plumbing systems can undergo large amounts of wear and tear over the course of your facility’s operational lifespan. With equipment running, in some instances, 24-hours a day/7 days a week the strain on these systems can potentially end up costing a significant amount of downtime and in turn, a loss of money. Preventive Maintenance is the perfect solution to ensure optimal equipment health. 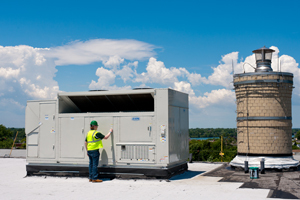 By performing regular Preventive Maintenance on your HVAC and Plumbing equipment, you can end up reducing energy consumption, increase the lifespan of equipment and level-out operating costs. Gold Coverage – While this program keeps the liability with Danforth, it excludes such features as system replacement, plumbing analysis and duct cleaning. Silver Coverage – This plan provides all the necessary labor and inspection procedures for your HVAC and plumbing systems. Bronze Coverage – This maintenance plan includes test and inspect services for your building systems. Start Your Preventive Maintenance Contract with Danforth. Meet with one of our Preventive Maintenance Service consultants. We’ll outline our process and begin your project estimate. Fill out an Online Estimate and we’ll reach out to you with a Preventive Maintenance Contract proposal designed to facility running at optimum efficiency. Get answers about our Preventive Maintenance services and speak with a knowledgeable Preventive Maintenance Expert.